The Crux Easton Wind Engine is a John Wallis Titt "Simplex" self-regulating geared wind engine, erected on this site circa 1891/92. Historically this engine type is an important and rare example of a transitional design in wind engine technology between the earlier annular sailed windmills (such as Haverhill in Suffolk and Owlesbury in Hampshire), of which no example survives and the 20th Century fixed blade galvanised wind engines (the "prairie type" wind pumps). 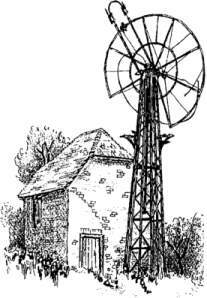 Crux Easton has a 20ft wind wheel on a 32ft hexagonal skeletal steel tower, which originally pumped water and ground corn. It has 48 canvas sails, each of which is 5ft in length, and their angle is adjustable to allow for variations in the strength of the wind. A fan tail enables the engine to turn into the wind. The tower has had to be extensively restored, as the original legs were corroded and in danger of collapse. Much of the wind wheel has also been restored, and where parts were missing, cracked or broken these were re-cast from the original components. It is thought that the lower part of the well house predates the engine. There is photographic evidence that the paved area on the West side of the well house was once covered by a lean-to building which, it is believed, housed a saw bench or an oil engine. Inside the mill house it can be seen that the walls have been increased in height at some date, and there is also evidence that other machinery was turned by shafting driven by the wind engine.